I’m pleased to announce that we’ve added a completely automated data importer for Lightspeed. This will work for most Lightspeed retail accounts. 1. 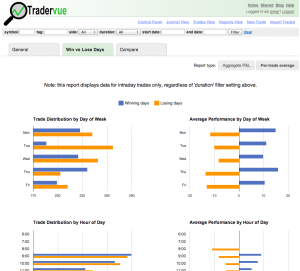 Completely automated – let Tradervue do the work! 3. Copy/paste or file import – you copy/paste data from the Lightspeed back-end site, or import a file that you export from there. To use the automated importer, just go to the Tradervue Import Trades page as before, choose Lightspeed, and follow the instructions. For those of you trading with trading firms that clear in another manner, stay tuned – we’ve got another announcement this week just for you! Just a quick update; the running P&L charts introduced last week have been updated, and will now work for multi-day swing trades as well as intraday. Note that the “all intraday trades” chart that shows all trades for a single day will still only work with intraday trades. We’ve added two more charts to Tradervue, which display your running intraday P&L. The Price Action tab shows you the same price charts you saw before, on your chosen timeframes with your trade executions plotted. 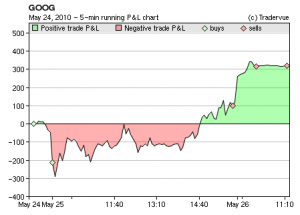 This is displaying the sum of both realized and unrealized P&L, and is displayed with either 1-minute or 5-minute resolution depending on how long the trade lasts. The zone in yellow is the timeframe represented by the current trade, so you can see how the particular trade you’re looking at fits into the overall P&L picture for the day. This chart is always shown in 5-minute resolution. 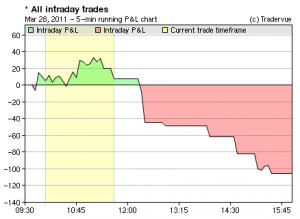 At the current time, these charts will only display for intraday trades. As always, if you have any feedback or suggestions, please send them to us at support@tradervue.com! 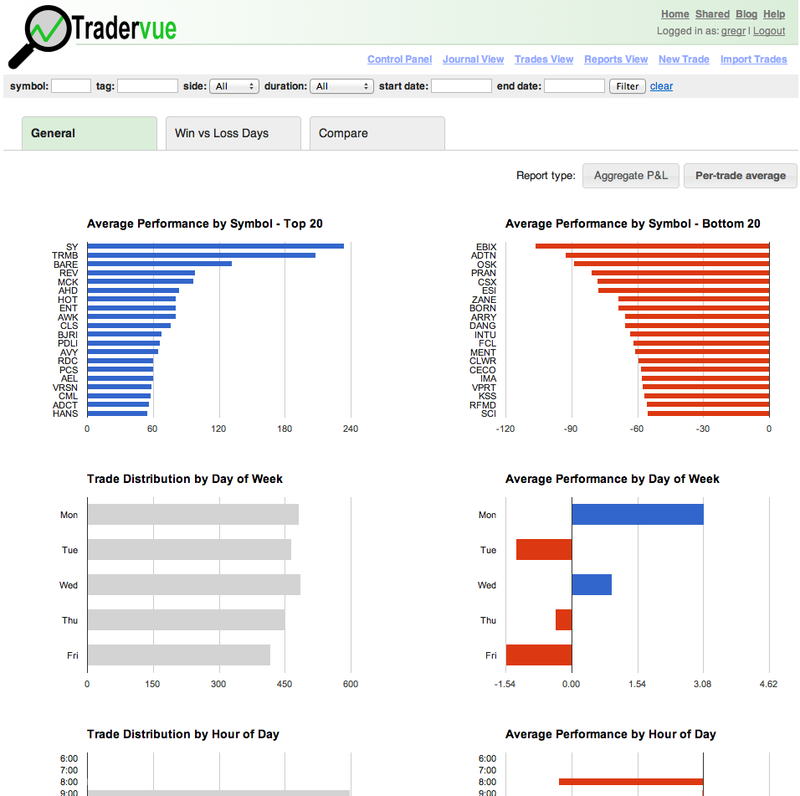 Tradervue now supports futures! 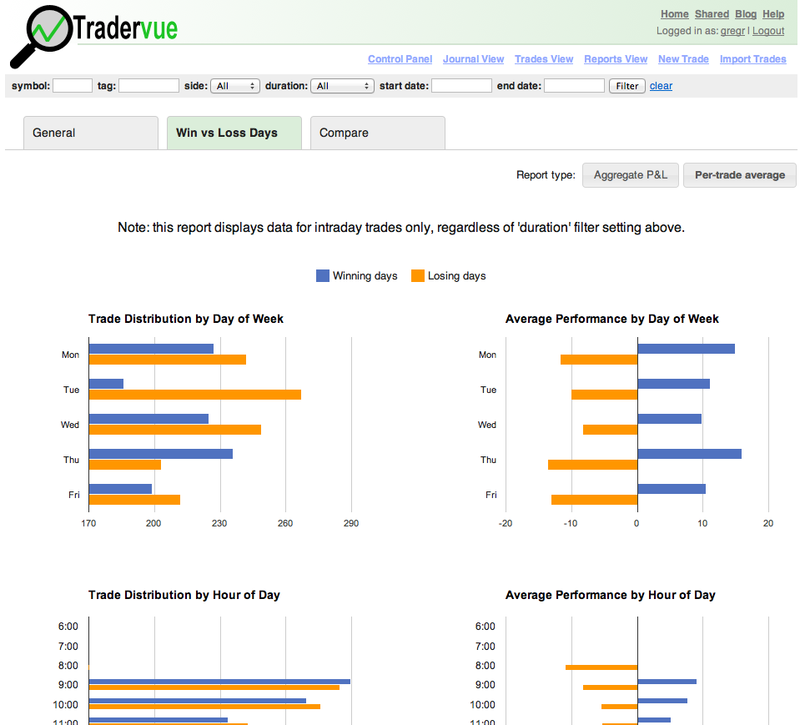 This has been one of the most common requests since Tradervue launched…so we’re very pleased to roll this out. You can already see some ES trades that homehedgie has shared; things work very similarly to how they work for stocks, but with the necessary changes for longer trading hours, P&L calculations, etc. The specific futures that we support are listed here. If there are other contracts you are trading, just let us know and we can add them to the list for you. And we’ve of course added futures support to the popular Generic Import Format. If your broker isn’t listed here, we either a) don’t support that broker yet, or b) we don’t have sufficient test data to ensure futures will import properly. In either case, please email us and we will do our best to get things updated! These are the reports you know and love that we’ve had from the beginning. Just some minor cosmetic changes here. This new report is designed to help you analyze what’s different (besides the obvious) between your winning and losing trading days. 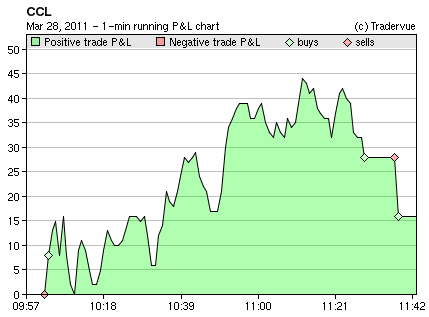 For example, perhaps on your losing days you’re making a much larger number of trades during the noon hour. 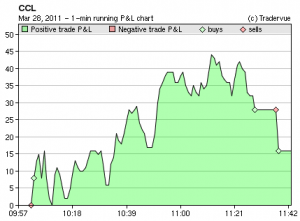 Keep in mind you might certainly have some losing trades on your winning days. 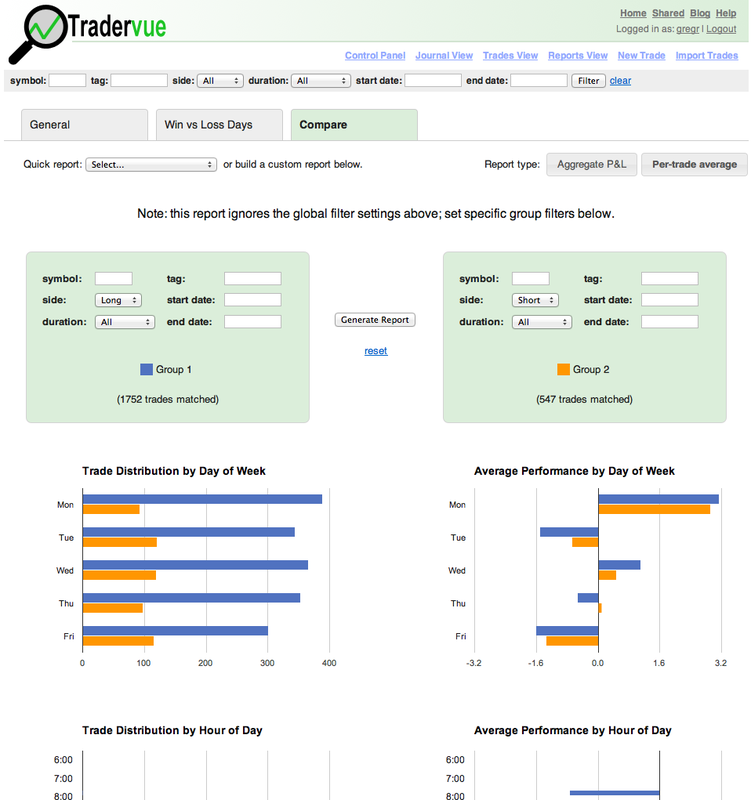 This report doesn’t group by winning/losing trades; rather, it separates your trades into winning and losing days, and shows all of the trades in each group. As usual, you can filter the trades that are included in this report using the global filter bar at the top of the window, with the one exception that only intraday trades are included in this report, regardless of the filter setting. This is the biggest new addition to the reporting, and the most exciting. The Compare reports are designed to show you the differences between any two groups of trades. Long vs short, last year vs this year, or support vs breakout trades. You can choose one of the “quick reports” to get started, or you can just dive in and build your own report by filling in the group filter boxes and clicking “Generate” to build your report. The possibilities are endless…give these new reports a try, and see what you can learn about your trading!